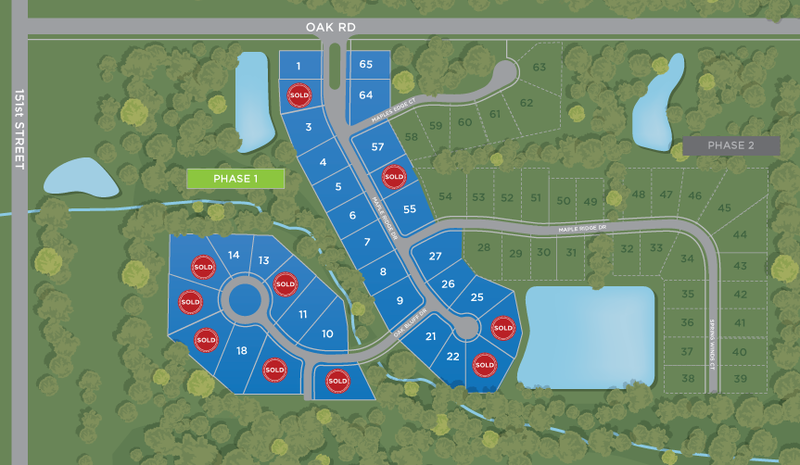 With beautiful mature tree lines, flowing creeks, and pristine ponds, the Maple Ridge community is focused on helping you maximize your living. You won’t find any other community in Westfield, Indiana like Maple Ridge. Adjacent to Cool Creek Park and only one mile from the popular Monon Trail, Maple Ridge provides the perfect location for those seeking an active lifestyle in Westfield. Every lot in this community shines a spotlight on nature and features breathtaking views of the wooded areas, ponds, or creeks. Here, you’ll find a home that helps you enjoy the finer things in life. At Maple Ridge, you’ll find homes and lots that meet your lifestyle. With plenty of options to choose from, your home is sure to be as unique as you are. The custom home builders at G&G will work with you to select the right lot to match your needs and design a floor plan to meet your lifestyle. Our goal is to make sure you feel at home the minute you step through the front door of your custom home. With established tree lines, creeks, and ponds bringing beautiful, natural landscaping to all of the lots at Maple Ridge, the only thing missing is your luxury custom home. With the help of the custom home builders at G&G you can experience this unique mixing of nature and luxury living every day. Features like full, finished basements, incredible pond views, and easy access to nature trails make it easy to see why anyone would want to call Maple Ridge home. Nature isn’t the only thing the community at Maple Ridge boasts. When you live in this community, you have convenient access to some of Westfield’s most beautiful areas. Looking for a great place to run, ride your bike, or even take an evening stroll? The Monon Trail, which stretches from Indianapolis all the way to downtown Westfield is only a mile away! Plus, directly adjacent to Maple Ridge, you’ll find Cool Creek Park. The park provides 4 miles of trails, scenic paths, playgrounds, and plenty of opportunities for family adventures. Are you looking for tips on building a custom home? G&G Custom Homes would like to offer you our FREE e-book. Get information about getting started, selecting a site, financing, the build process and so much more.